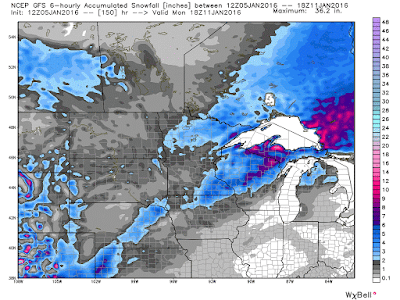 Midwest Winter Weather Blog: Some Snow, Excessive Cold Brought down by a Polar Vortex Piece. Some Snow, Excessive Cold Brought down by a Polar Vortex Piece. The coldest air mass of the season is on the way for the beginning of next week. Temperatures will run 15-25 degrees below average across much of the Midwest by Sunday, this trend will work east through the middle half of the month. There is little doubt that with the combination of winds and cold temperatures, wind chill advisories will be issued sometime next week. This weather will affect the Minnesota Vikings vs Seattle Seahawks NFL game on Sunday, set to be played in Minneapolis at noontime. The temperature will likely stay below zero for the duration of the game, with windchills well below zero. 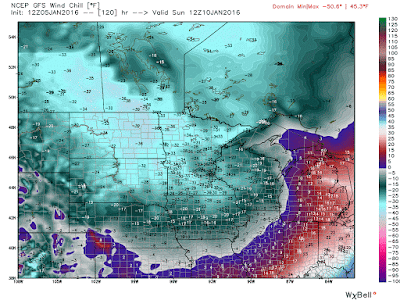 The cold will begin to be a major storyline in the next few days. The overall pattern of cold is brought to us from the weakening strength of the Polar Vortex. Measured, in part, by the Arctic Oscillation, the AO (for short) is forecasted to tank by the weekend. With this circulation weakening, lobes of cold air are allowed to be displaced from the north and reach down to lower latitudes. Think of it as a spinning top, when its strong all of the top is focused in the center of rotation, but when it starts to wobble, it begins to poke further away from the center of rotation. The same thought process is effective when thinking about the polar vortex. The cold is further tapped into thanks to a couple open wave system, or weak areas of low pressure that are expected to pass through the Midwest over the next couple days. 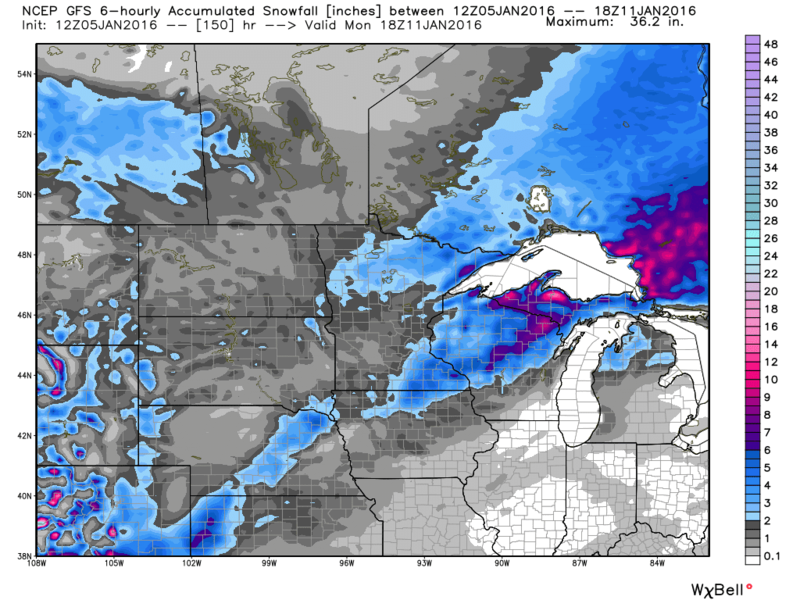 The GFS (global forecast system) model for snowfall is attached above, courtesy of weatherbell. A general 3-5" of snow is possible over the next several days. Contrary to some posts on twitter and facebook you may have seen, this will not be a large system! Partially due to the fact that to energy in the four corners region will be ejected in pieces, instead of one large cluster. Either way, behind the system(s) winds will shift out the northwest and usher in much colder air into the region. Another surge of cold is forecasted on the European model, as seen in the animation above, next week. Below is a look the forecasted wind chills for Sunday morning! They do not moderate much through the next 48 hours, as temperatures and winds continue to be cold and strong, respectively.